Union Cabinet decided to merge all the remaining five associate banks of State Bank Group with State Bank of India in 2017. 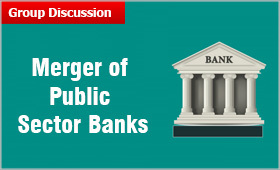 After the Parliament passed the merger Bill, the subsidiary banks have ceased to exist and the State Bank of India (Subsidiary Banks) Act, 1959 and the State Bank of Hyderabad Act, 1956 have been repealed. Five associates and the Bharatiya Mahila Bank have become the part of State Bank of India (SBI) beginning April 1, 2017. This has placed State Bank of India among the top 50 banks in the world. The five associate banks that were merged are State Bank of Bikaner and Jaipur (SBBJ), State Bank of Hyderabad (SBH), State Bank of Mysore (SBM), State Bank of Patiala (SBP) and State Bank of Travancore (SBT). The other two Associate Banks namely State Bank of Indore and State Bank of Saurashtra had already been merged with State Bank of India. After the merger, the total customer base of SBI increased to 37 crore with a branch network of around 24,000 and around 60,000 ATMs across the country. The quest to create an Indian bank that will be in the league of global giants is an old one and had been continuing since 1990. However, in February 2017 the government had approved the merger of five associate banks with SBI. Later in March, the Cabinet approved merger of BMB also. SBI first merged State Bank of Saurashtra with itself in 2008. Two years later in 2010, State Bank of Indore was merged with it. The board of SBI earlier approved the merger plan under which SBBJ shareholders will get 28 shares of SBI (Re1 each) for every 10 shares (Rs10 each) held. Similarly, SBM and SBT shareholders will get 22 shares of SBI for every 10 shares. Post merger, the SBI has been in the process to rationalise its branch network by relocating some of the branches to maximise reach. This, according to SBI will help the bank optimise its operations and improve profitability. SBI had approved separate schemes of acquisition for State Bank of Patiala and State Bank of Hyderabad. There was not proposed any share swap or cash outgo as they were wholly-owned by the SBI. Group Discussion (GD) is widely used for Admissions to top MBA colleges, Job interviews, and other selection process. GD Tips: Learn how to start a group discussion, take the lead, make positive impact, and score high. Top 100 GD Topics: GD topics can be based on Current Affairs, Business & Economy, Social Issues, or Abstract. Prepare GD with MBAUniverse.com. Read 100+ GD Topics with Answers, Solutions. New topics added every week. The merger will reduce the cost of banking operation. The objectives of financial inclusion and broadening the geographical reach of banking can be achieved better with the merger of large public sector banks and leveraging on their expertise. The merger will help the geographically concentrated regionally present banks to expand their coverage. Larger size of the Bank will help the merged banks to offer more products and services and help in integrated growth of the Banking sector. Merger will help in improving the professional standards. A larger SBI can manage its short and long term liquidity better. There will not be any need for overnight borrowings in call money market and from RBI under Liquidity Adjustment Facility (LAF) and Marginal Standing Facility (MSF). In the global market, the Indian banks will gain greater recognition and higher rating. With a larger capital base and higher liquidity, the burden on the central government to recapitalize the public sector banks again and again will come down substantially. Multiple posts of CMD, ED, GM and Zonal Managers will be abolished, resulting in substantial financial savings. Bank staff will be under single umbrella in regard to their service conditions and wages instead of facing disparities. Managing Director of Federal Bank, V.A. Joseph is of the view that Co-existence of the big, medium and regional banks would be preferable in the present scenario. According to him most acquisitions in India were borne out of compulsions and over 90 per cent of past acquisitions had failed to achieve the objectives. Many banks focus on regional banking requirements. With the merger the very purpose of establishing the bank to cater to regional needs is lost. Large bank size may create more problems also. Large global banks had collapsed during the global financial crisis while smaller ones had survived the crisis due to their strengths and focus on micros aspects. With the merger, the weaknesses of the small banks are also transferred to the bigger bank. So far small scale losses and recapitalization could revive the capital base of small banks. Now if the giant shaped SBI books huge loss or incurs high NPAs as it had been incurring, it will be difficult for the entire banking system to sustain. Cashless Economy: Is Society ready for transformation? Impact of Technology on Jobs: Will Automation & Artificial Intelligence reduce or increase Jobs? Crypto Currency: A bright future or just a fad?